Not a great amount of changes this week! Darcy Cameron (RUC, 170,000) debuting is among the biggest news after averaging massive numbers in the NEAFL. The 9.7% of owners who held onto Josh Battle (FWD, 284,000) can welcome him back this week, just like the 33.3% that own Joel Smith (DEF, 265,000) and the 19.8% that held Sam Murray (DEF, 495,000). Jarrod Lienert (DEF, 170,000) is again in the extended squad, as is Brett Deledio (FWD, 591,000) after a successful NEAFL return. David Swallow (MID, 555,000) is an exclusion I didn’t see coming, he and Jimmy Webster (DEF, 500,000) have burned POD-hunters this round, as has Matthew Kreuzer (RUC, 518,000). 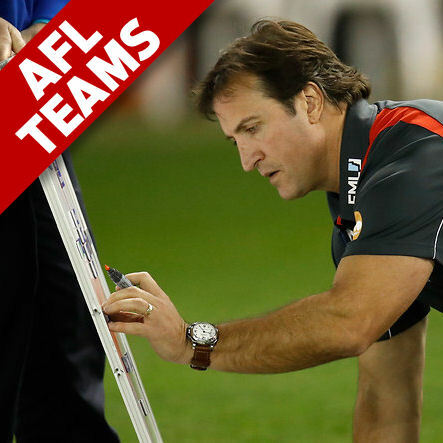 Michael Hibberd (DEF, 458,000), James Sicily (DEF/FWD, 645,000), and Nic Naitanui (RUC, 546,000) will all miss extended periods and are must-trades. Finally, Robbie Gray (FWD, 492,000) and Josh P. Kennedy (MID, 607,000) have both been named. St. Kilda: Josh Battle, Sebastian Ross. Richmond: Nathan Broad, Connor Menadue, Kamdyn McIntosh. Collingwood: Sam Murray, Mason Cox. Gold Coast: Jacob Heron, Kade Kolodjashnij, Jesse Lonergan. Essendon: Orazio Fantasia, David Zaharakis. Fremantle: Taylin Duman, Darcy Tucker. Adelaide: Daniel Talia, Mitch McGovern. 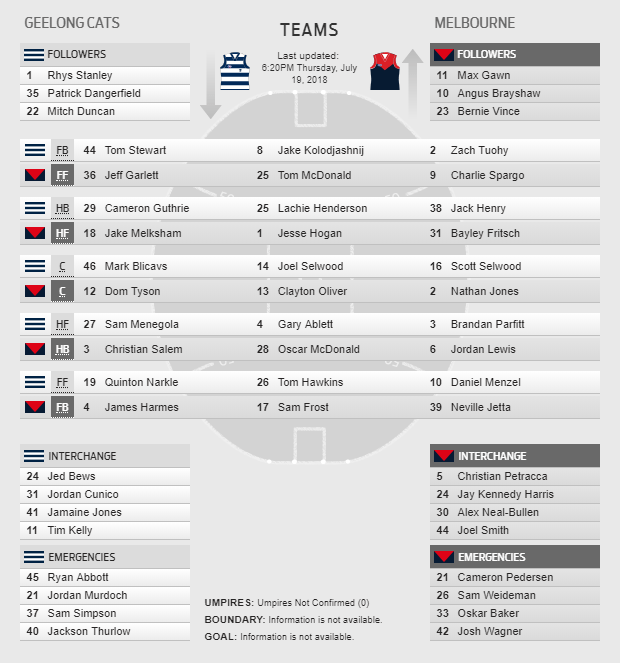 Geelong: Lachie Henderson, Jordan Cunico. Melbourne: Dom Tyson, Joel Smith. Carlton: Jacob Weitering, Levi Casboult, Matthew Lobbe, Matthew Wright. 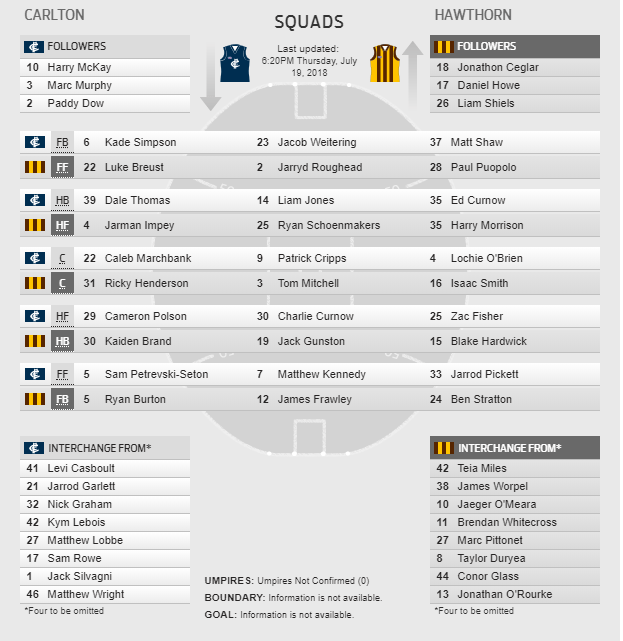 Hawthorn: Kaiden Brand, Ryan Schoenmakers, James Worpel. West Coast: Dom Sheed, Nathan Vardy. Western Bulldogs: Hayden Crozier, Tom Boyd. Port Adelaide: Jasper Pittard, Jarrod Lienert. 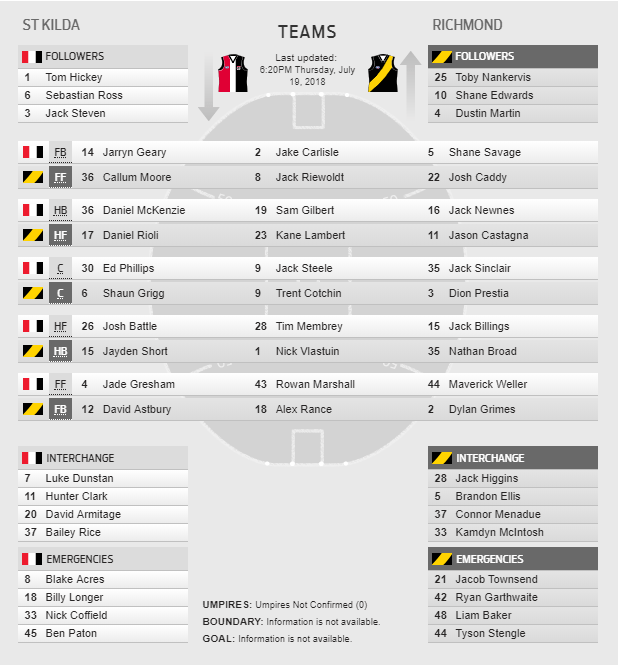 St. Kilda: Jack Lonie (Injured), Jimmy Webster (Injured). Richmond: Bachar Houli (Injured), Shai Bolton (Omitted), Corey Ellis (Omitted). 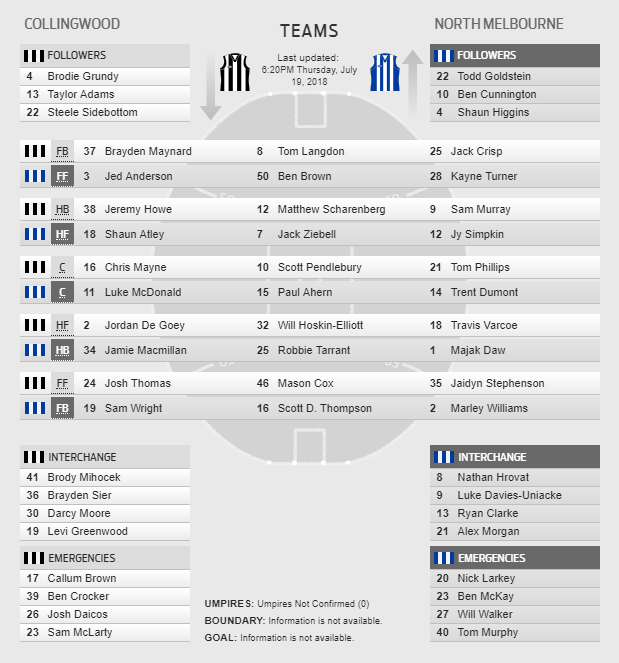 Collingwood: Ben Crocker (Omitted), Josh Daicos (Omitted). Gold Coast: David Swallow (Rested), Josh Schoenfeld (Omitted), Jack Martin (Injured). Essendon: Conor McKenna (Injured), Jake Long (Omitted). Fremantle: Ryan Nyhuis (Suspension), Stephen Hill (Injured). Adelaide: Kyle Hartigan (Injured), Taylor Walker (Suspension). Geelong: Sam Simpson (Omitted), Wylie Buzza (Omitted). 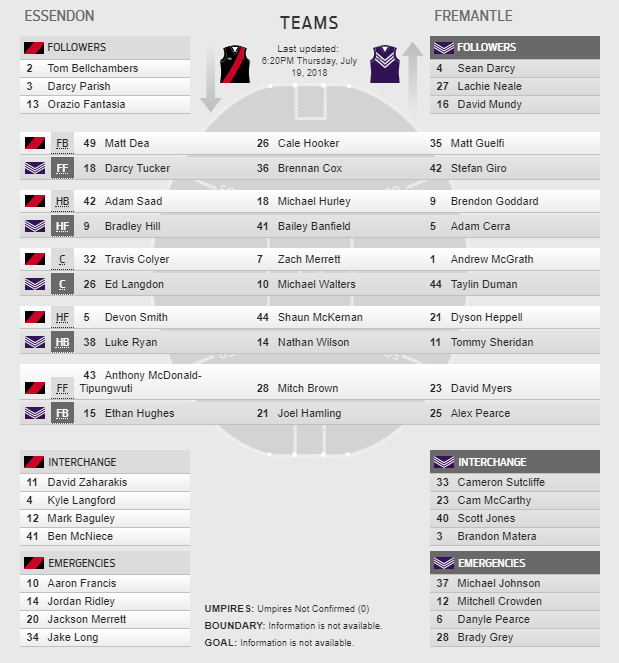 Melbourne: Mitch Hannan (Injured), Michael Hibberd (Injured). Carlton: Matthew Kreuzer (Managed), Jed Lamb (Suspension), Jarrod Garlett (Omitted), Sam Rowe (Omitted). Hawthorn: Tim O’Brien (Omitted), James Sicily (Injured), Taylor Duryea (Omitted). 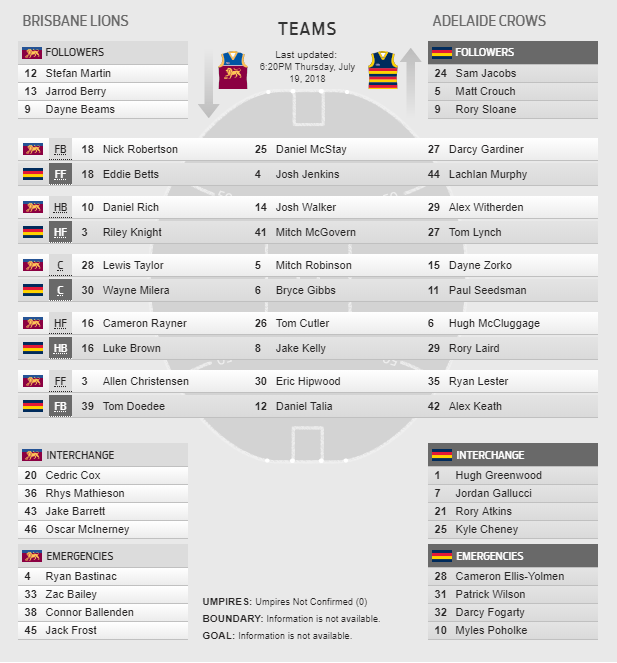 West Coast: Nic Naitanui (Injured), Jake Waterman (Omitted). 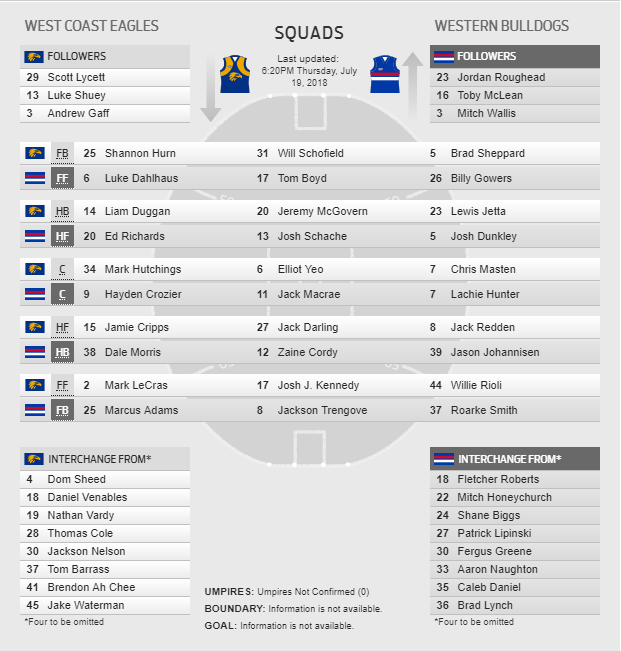 Western Bulldogs: Patrick Lipinski (Omitted), Shane Biggs (Omitted). Port Adelaide: Paddy Ryder (Injured), Riley Bonner (Omitted). GWS Giants: Ryan Griffen (Injured). WTF saints? They gonna wait for Freeman to get injured again and miss half year before thinking about giving him a debut? OMG Cameron’s finally getting a game! Means you can downgrade R3 (presumably O-Mac), get that cash for upgrades, and still have ruck cover in case of a late out. Win! Nah, Jones is my R3. Haven’t needed a ruck emergency yet this season (touch wood) so I’ll be interested to see how Cameron goes. Which of them will play more often, who scores more and who makes the most fast cash? 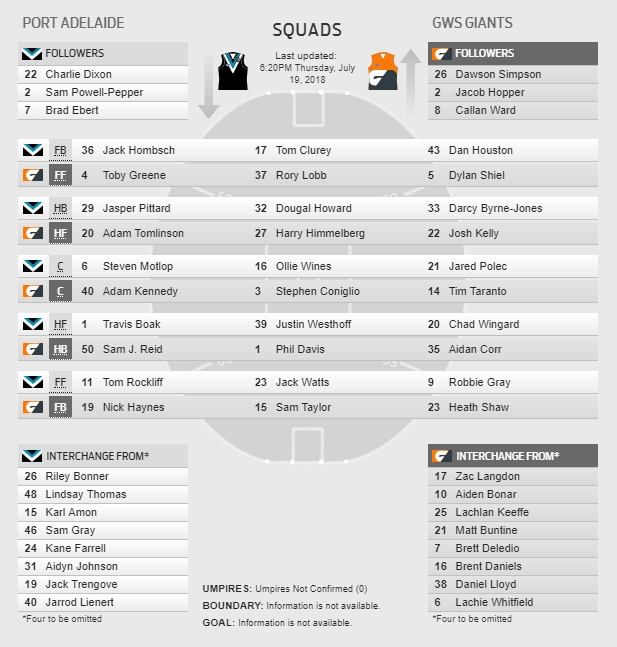 Degoey to westhoff or doedee to simpson? Westhoff’s a top six forward – in great form and consistent. Loving having him in my team. I’m a Simpson owner and, while he’s clearly a top six defender, I do have slight concerns about his fitness atm (calf?) so I’d suggest waiting another week to see how he goes. And while Doodles probably won’t set the world on fire at least you can rely on a respectable 70 or so. Is it a good idea to bring in COR for Sic and field him for the rest of the season? Have 2 trades left in RDT and team is complete, and this allows me to do Ahern or another rook to Macrae and have 9 premo mids which I can switch around depending on matchup or injuries. Don’t be fooled! The order in which clubs list their extended bench and emergency players means nothing! Don’t rely on this as an indication of who’s more likely to play. But I do take your point about being wary of Horse and his rookies. I certainly wouldn’t be relying on O’Riordan to play out the season. I reckon his spot might be precarious when McVeigh returns. Good to have him generating cash on the bench, but I wouldn’t assume he can hold a spot on your field. Jayden Short has been tracking really well too..
Parker or Rockliff out for Danger? Wilson can be swapped with Ahern. What do we do with Robbie Gray? Anyone still holding him? I was originally planning g to trade him to danger but seeing him back in I’m now tempted to trade Guelfi for danger who’s sitting in f6 currently. Thoughts?? With a tag likely for Sidey this week and Eagles playing the Dogs, would it be worth trading Steele for Shuey?? Shuey likely to outscore him this week, but I’m doubtful Shuey remains my M8 for the rest of the season and the trade leaves me with 17k in the bank..
Who’s going to tag him ? Could only do one thing to it, couldn’t it?